Summer time anywhere in America evokes memories of long, hot days, sitting in the shade on a porch or under a large tree eating something cold and sweet. Sweet like a New Orleans summer this porch front favorite is a classic that will help you keep the heat at bay. 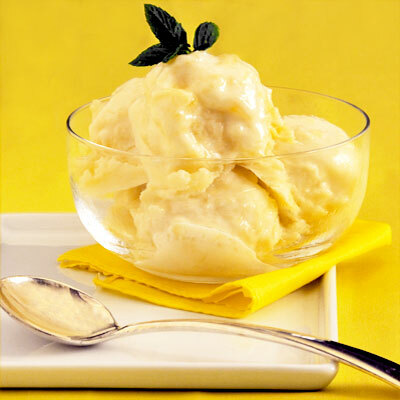 Combine pineapple, sweetened condensed milk and lemon juice in a bowl and chill in the refrigerator for several hours. In a separate bowl, beat the egg whites with a pinch of salt. Take the chilled mixture from the refrigerator and fold in the beaten egg whites in 3 additions. Freeze in an ice cream maker according to your machine’s directions. The sherbet will be soft. It may be served as is, or placed in a freezer to freeze harder. Scoop into sherbet or ice cream bowl, garnish with mint (optional) and can serve with a small cookie or wafer. A recognized food blogger and columnist, New Orleans native Gisele Perez, is an established chef in Los Angeles, California, with her company, Small Pleasures Catering. To learn more about Gisele, visit her blog site, www.PainPerduBlog.com, and her company website, www.SmallPleasuresCatering.com.